Philpott returns as CEO to the UK after having served as Kia's managing director in the country. LONDON -- Kia named its European No. 2 Paul Philpott as CEO of the automaker's UK and Ireland unit. 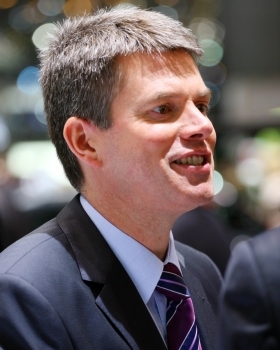 Kia said Philpott is the first non-Korean head of any Kia subsidiary in Europe and the move is part of the carmaker's plans to devolve responsibility to local regions. Philpott, 45, became chief operating officer of Kia Motors Europe in 2009, following two years as managing director of Kia in his native UK. "The Kia brand is now Europe's fastest growing thanks to Paul Philpott and he knows very well that we are determined to strengthen local management at all our subsidiary companies," Kia Europe CEO Brandon Yea said in a statement issued today. Yea added: "This promotion is putting an individual with specific local expertise into a role that we have previously filled from headquarters in Korea." In the same statement, Philpott said: "I look forward to putting Kia right into the top rank of premium volume manufacturers in the UK." In his new role, which starts on July 1, Philpott will report directly to Yea. He will replace Simon Huh who will become Chief Executive Coordinator of Kia Motors UK. Kia has aggressive sales targets in Europe where it aims to boost sales in its European markets by 20.7 percent to 350,000 vehicles this year, after a 10.7 percent rise in 2011, with its market share rising to 2.7 percent, up from 2.2 percent last year. Kia aims to reach annual European sales of 400,000 by 2013, equivalent to 3.1 percent market share, Philpott told Automotive News Europe at the Geneva auto show last month. He said sales will be helped by the renewal of Kia's product lineup in Europe. It began with the new Sportage SUV in 2010 and will be completed by a new five-seat and seven-seat compact minivan that will replace both the Carens and Carniva minivans next year, Philpott said. Kia has launched new versions of the Picanto and the Rio subcompact. A key launch this year is the Cee'd compact range. The new Cee'd five-door arrives in showrooms in May, followed in September by a wagon version. At the Paris show in September, Kia will unveil the sporty Procee'd three-door. Philpott joined Kia in 2007 from Toyota UK, where he was commercial director. Prior that he worked at Ford in the UK in the sales and marketing division. During his previous role as Kia's UK managing director, the brand's market share share rose to 2.3 percent in 2009 from 1.4 percent in 2006. Last month, Kia had a 3 percent share. Michael Cole, Kia Motors UK Managing Director, said he is delighted that Philpott is returning to the UK. His "understanding of the relationship between manufacturer and dealer network is unrivaled," he said in a statement. Kia has yet to appoint a new chief operating officer for Europe.